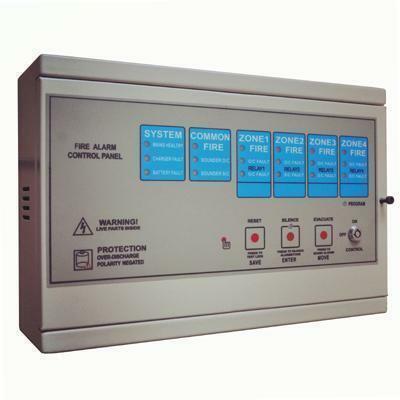 KS-501-4 is a conventional fire alarm control panel for 1,2,4 zone. This highly cost-effective fire alarm control panel is designed to meet the latest market requirements and it is perfect for fire safety protection. Push buttons for Evacuate, Reset and Alarm silence. Monitored alarm circuits for both open & short circuit. Indicators for Charger fault & Battery fault. All controls are on front fascia. Knockouts on top and bottom sides for easy installation. Main supply - 240 V AC +/- 10%, 50 / 60 Hz ,Battery supply - 24 V DC/1.3AH (Sealed Lead Acid). (Self-) Resettable fuse protection-Charging voltage, Sounder circuit, Reserve battery and DC connection. Auxiliary relay contacts - 30 V DC, 1A, NO/NC.